This post was originally published on March 15, 2009. It was substantially revised and re-posted on October 26, 2015 as part of Villains Week. 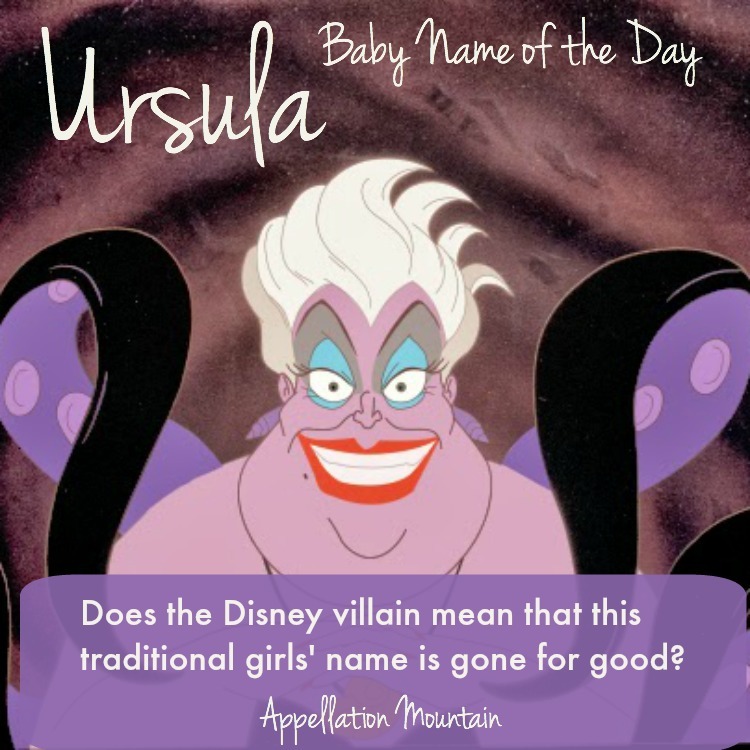 It could be a clunky-cool choice for a daughter, but instead, it’s a Disney villain name. Thanks to Natalie for suggesting Ursula as our Baby Name of the Day. 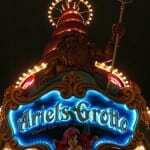 Disney’s The Little Mermaid propelled the name Ariel to new heights in 1989. But it did no favors for Ursula. The traditional version of the fairytale includes a sea witch, who uses magic to turn the mermaid’s fish tail into legs. Disney named her Urusla, and made her a purple-skinned, white-haired, tentacle-waving menace. Technically, she’s a cecaelia, a woman-octopus hybrid. In the fairytale, the witch casts her spell and retreats to the background. But in the movie, she’s a major bad-guy with a thirst for power. Sometimes villain names catch on. But no one had been naming their daughter Ursula well before 1989. The name never cracked the US Top 400. It last appeared in the Top 1000 back in 1983, and in 1988, just 127 girls were given the name. But there was a sharp drop in the name’s use after The Little Mermaid debuted. In 1989, Americans welcomed a mere 105 Ursulas. By 2014, that number was just 23. Despite the name’s association with a power-hungry half-octopus, it actually comes from the Latin ursa – bear – think Ursa Major and Ursa Minor. The name was made famous by a legendary saint. 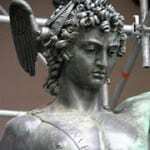 The saint’s story begins in England, sometime around the fourth century. The story goes like this: Ursula was a Christian princess, set to marry a pagan ruler overseas. 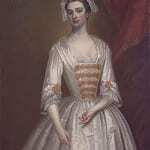 When her ship landed, the devout princess announced that she wished to make a pilgrimage to Rome prior to her marriage. Ursula made it as afar as Cologne, where she met her death at the hands of the Huns. Here’s where things turn unbelievable. It’s said that Ursula sailed with 11,000 handmaidens, and the Huns dispatched all 11,001 of them. Their bones are still on display in Cologne’s Basilica of St. Ursula. The bones are real, but it appears that Ursula’s party was far smaller – perhaps eleven handmaidens. An inscription reading XI. M. V. – eleven martyred virgins – may have been misinterpreted as eleven thousand. It’s a heck of a medieval typo! The story became quite popular in the Middle Ages, so while the bones likely come from many of the deceased over the many years, the story of 11,001 martyrs remained popular. There is a historic Saint Ursula, born Julia in 1865, and the founder of a religious congregation. Honey Ryder – the first Bond girl in 1962’s Dr. No – was played by Swiss-born actress Ursula Andress. Ursula saw a brief resurgence in the 1960s thanks to the Swedish starlet. Disney’s sea witch and Friends‘ psychotic twin came at a moment when no one was naming their daughter Ursula. It seems unlikely that the name will make a comeback. It’s an unconventional choice, but one with fascinating roots and an interesting style. What do you think of Ursula? Is this name gone for good? I named my daughter Ursula in 2011, not knowing that the Little Mermaid was such a “big deal” (I saw it once when I was 15, and had no memory of the characters’ names, plus even when it was brought to my attention, I thought “really? A Disney movie? Who cares?”). So I fight with the sometimes negative reputation that precedes it…which bugs me! Because I really like the name! It’s strong, but still feminine, has a sweet meaning, and it’s unique. I hope my sweet girl loves it some day as I do. And I’m happy to see the positive comments on here! Yay for Ursula! Have frequently had the fantasy of naming siblings or fraternal twins Boris and Ursula, for obvious reasons 🙂 (little bears). Ursula is my middle name, and I was born in 1979. Both my first and middle names, Anna and Ursula, came from D.H. Lawrence’s The Rainbow. I’m supremely annoyed many people think only of The Little Mermaid, as though my middle name were created only for that character. For awhile, I went by my middle name, since my real first name is more common than dirt. I also wanted to name my future firstborn daughter Urszula, using the Polish spelling to tell us apart. If I ever have kids, and have enough girls, I may very well name a daughter Ursula. I love how universal the name is, existing in many different languages, like Icelandic, Dutch, German, French, Hungarian, Italian, and Spanish. I’ve always adored the name Ursula. I had a school acquaintance with that name (born in the 70s) and my first impression of it is associated with her. Stunningly beautiful, with long wavy dark hair and a very kind and gentle person. I also like the association with she-bears. It’s a name with both real life and powerful mythical associations for me. It’s also quite lovely sounding to my ear and nice to say. It’s one of the names I would have liked to give to a daughter, but my husband has put the kibosh on it, unfortunately (for her!). This was on our short list, as my husband’s nickname is Ursao (Big Bear). I always thought it’d make a nice sibset with or alternative to Olivia. I say it UR-suh-la. I’ve been crushing on Ursula for years! Any thoughts on a little Ursula with the nickname Zuzu? I know it’s a huge leap from the original formal name but I’ve always really loved both, and the sound is there. Think anyone would call us out? Ohmygoodness – Ursula called Zuzu is exactly what I would be tempted to use! I figure that if Sue/Susie seems like a logical nick for Ursula, why not Zuzu? I am of the Disney Renaissance generation, but I really like the name Ursula. In Les Miserables, Marius is guessing what Cosette’s name might be before he meets her, and he imagines that she would be an Ursula. I really like the variant Ursuline, as well. I have a friend, about my age, who’s named Ursula. It works beautiful for her, and I want to love it (I think it would be cool with my own surname, which begins with U — how often do you get U.U.? ), but the Disney villain associations are just too strong for me. I wouldn’t use it myself, but I don’t dislike it. I think first of Urszula Radwańska (OOR-shoo-lah) [I’m a tennis fan], then of Ursula Buffay (UR-suh-luh). Funnily, I don’t think of the Ariel character anymore, even though I’m the right age for it. Emmy Jo – I’m in exactly the same position as you! I really want to like Ursula – she’s very cool, whilst has a quirky feminine vibe going on, but all I can think about is an evil purple sea witch. Why oh why was I such a disney slave when young!?! Ursula is really cool, I pronounce it UHR-suh-lah, and I really like Sula (SUE-lah) as a nickname. Ursula is a very spunky name to me, quite like Trixie. I don’t think I’d ever use it as a first, and my partner would never let me. I think I prefer Ursuline (I pr. it UHR-suh-line) instead, it seems softer and a bit more dignified. I think it is UHR suh lah … like Lola says, not quite “Sue” in the middle. Emmy Jo, I now have “poor unfortunate souls” running through my head. Yikes! Having grown up watching “The Little Mermaid” (over and over and over) I’m having a hard time getting around the sea witch associations. Meeting a lovely little girl named Ursula would probably help break this association — it does have a very pretty sound — but until I meet a real-life Ursula, she will remain the sea witch. Sarah, I say it Ur-sue-la, with a very soft -sue sound in the middle. So sweet! I’ve mentioned before my Rssian cousins? You should hear them say Ursula, absolutely beautiful! Agnes sounds delightful in Russian, as well, for that matter. I find Ursula soft, pretty and feminine but not frilly. I think about maybe a middle spot for her, I do have a cousin with the name. And would be completely enchanted to meet a little Ursula here in the States. Sweet, melodic, strong, feminine and unfussy. Absolutely perfect, Ursula is, for me! What a fantastic, stand apart name! In spite of love for excessivly pretty girly names think I might like her – just a bit. Shes grounded. Sensible. Not to fussy. Sure to stand out in classrooms full of frilly little Isabella’s and Ava’s whilst still retaining a feminitity. I like that about her. For me she is lacking something though. She doesnt really have the free spirited hippy airy-ness I like. Too much like Agnes’s sister ie. unadventurous despite low popularity. On someone elses child – definatly. For my own – I don’t think so. Plus ‘HE’ would NEVER go for it. PS. Is she pronounced Ur-sha-la or Ur-sue-la or Ur-shue-la? I think I like Ur-shue-la the best. But it is still quite awkward to say. 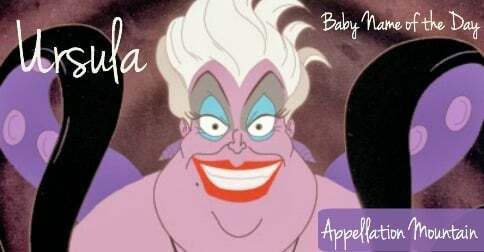 […] Ursula – Yes, she’s the scheming sea witch who makes a deal with the Little Mermaid. […] One you love but are afraid to use?